Gareth Bale has indicated that he expects to remain at Real Madrid next season despite the departure of Carlo Ancelotti from the Bernabeu. The Wales forward, 25, tweeted on Tuesday: "Will be working hard in the off season and looking forward to coming back next season stronger with Real Madrid." 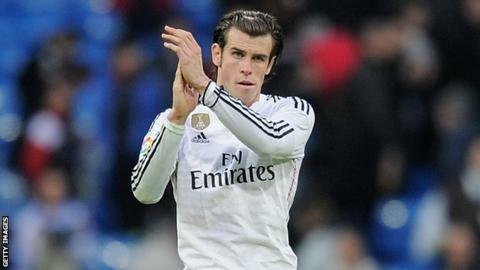 Bale has been linked heavily with a return to the Premier League. Napoli manager Rafael Benitez is expected to be the new Madrid boss. Bale is the world's most expensive player after being signed in a £85.3m deal from Premier League side Tottenham in September 2013. The former Southampton trainee scored 24 goals in 46 games during his debut season in Spain, helping Madrid win the Champions League and Copa del Rey. But he has been jeered by some supporters in his second season and faced heavy criticism from sections of the Spanish press. Real finished runners-up to Barcelona in La Liga and lost to Juventus in the semi-finals of the Champions League. "Not the end of the season we had hoped for, we always want to win trophies!" added Bale on his social media account. Bale is expected to win his 50th cap for Wales on 12 June in the Euro 2016 qualifier against Belgium in front of a sell-out crowd in Cardiff. And Wales manager Chris Coleman says he expects Bale to stay at Real Madrid despite the upheavals at the Bernabeu and reports linking him with Manchester United. Asked if he expected Bale's future to change at Real, Coleman said: "I don't." Coleman believes Bale, who he has included in a 23-man squad for the clash against the Belgians, will decide where his future lies. "The Real Madrid president Florentino Perez thinks a lot of Gareth," added Coleman. "I don't think he wants to leave. It's arguably the biggest club on the planet. Coleman, who managed Real Sociedad in Spain, says he would like to see Bale stay at Real from a Welsh point of view. "I know what the Spanish league is like. The tempo is different. It's not as physical as the Premier League," said Coleman. "Our boys who play in the Premier League week in week out they feel it. "From that perspective Bale when he comes to us, physically he's in better shape. "It's less taxing in La Liga than the Premier League so from that point of view I'd like to see him stay where he is." Coleman said he had a "brilliant" working relationship with Ancelotti, his assistant Paul Clement and the Real Madrid medical team and has some sympathy for them. "I've known Paul Clement for a long time from my Fulham days," added Coleman. "I know Rafa Benitez also." He joked: "The good thing for me is it's another trip to Madrid for me to have a few days with Rafa and make sure that he's comfortable with us."